In celebration of International SUNday we held a solar observing session at our regular Blackheath location on……Saturday! This was due to the better forecast offered on this day, which, despite some cloud from time to time, proved to be the right choice. There was a good turnout of scopes, which as many as seven different scopes set up (and one camera) offering various views in both White Light and H-Alpha. It was also good to see Grey Lipley return with scope in hand after suffering from illness for a while. Good to have you back Grey. A steady stream of visitors and passing families from around 1.30pm onwards got to experience some excellent views of the Sun. Despite officially finishing at 5pm, Tej stayed to around 6.30pm due to public demand! We were rewarded visually with some excellent views. 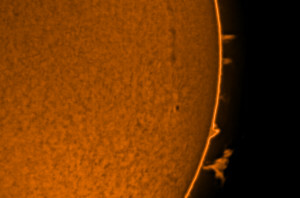 In White Light a number of Sun spots were clearly visible and in H-Alpha we were able to see not only fine surface detail but were treated to a break away prominence and the sight of a magnetic loop being formed. The latter being quite spectacular. A big thanks to all those who attended the event. It was much appreciated. We look forward to hosting another Solar event (in addition to the ROG events) in due course prior to the return of dark nights, which are of course now drawing in….